Like a lot of people who have experienced tragedy, Anne wondered how God could do this to her. Although it took six years, she survived, moved on and became victorious over both her guilt and despair. In 2005, she wrote her story, A Twist of Faith, which tells of her healing and building a worldwide business to support her husband’s counseling mission. 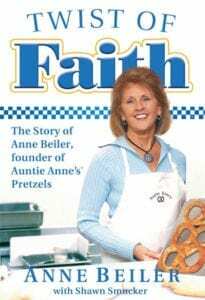 With only an 8th grade education, Anne started what became Auntie Anne’s Pretzels when she bought a pretzel stand in a local farmer’s market. Her mission was to support her husband’s desire to offer free counseling to couples, much as they had experienced after the death of their daughter. She had no work or business experience, but used her greater goal and her belief, “We get to give and give to get again” to help her grow her business. 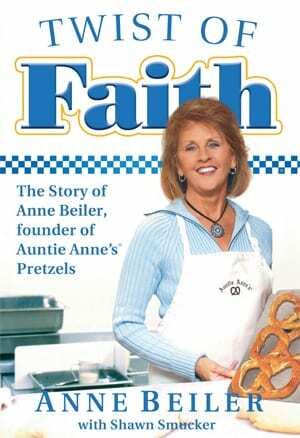 She sold her pretzel company, which grew to be the largest mall-based pretzel company in the world with about 1,500 stores. Anne says that you have to focus on something other than your own pain to heal. Once she was able to say, I’m not okay, and share that with others, she started to heal. That is why she is focused on her new mission to help and empower women. She calls it 7 Women 7 Stories. From her home in Toledo, Texas, she holds classes to give women an opportunity to sit in a room with seven women. Each woman has one hour to tell her story. Anne says the power of that telling will project them into a whole different lifestyle. Hear more of her inspiring story and guidance of how her faith changed her life in this conversation. And check out how she is helping others change their lives on her website.